The basic idea is this: a simple, mostly automated all-grain brewing system that could be used in an apartment to turn a big bag of grain into a frothy keg of beer with the least amount of work possible. And, it turns out, we did it. But like all simple ideas, there is a much longer story. It all starts with my dad and his fetish for Crock Pots. About three years ago my dad got a new Crock Pot, one of the large size ones they carry at Costco. As he tends to do with things like this, pretty soon he began ponder the extremes of Crock Pot cooking--and just how far one could push the limits of the Crock Pot. Many of the details of this years-long experiment are not fit to print, but let me just say the culmination was one Thanksgiving where every dish on the table, including the turkey (I'm not kidding! ), had been prepared in a Crock Pot. Even he will admit it had gotten a little out of control. 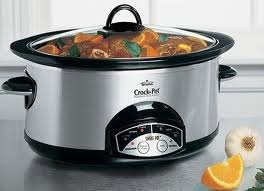 And the great Crock Pot experiment was not limited to that actual device, but soon began to include other methods of automated cookery--including an electric pressure cooker and an amazingly successful experiment to turn an electric "Fry Daddy" into a Sous Vide water bath cooker (retail versions of which cost in the thousands). That particular invention was created via multiple late night Skype video chats between my father and my brother Josh in California--in actuality Josh is usually the brains behind the operation and my father is the bankroll and the guy crazy enough to actually build these crazy things. This "automated apartment beer brewing system" developed similarly through late night Skype conversations between my dad and brother. It all started when my brother got a hold of a 100 cup percolator coffee pot from his church that was broken. He brought it home to fix, and started pondering how such a device could be used to make beer. As he and my dad discussed this over video chat, the idea started rolling--and they realized that an insulated pot would be even more effective, and the online research began. The conversion of the pot was relatively simple. The brew basket was dropped to the bottom of the pot, fitted with a couple of extra screens (from the Cash and Carry restaurant supply store) and a PVC tube to form a seal at the edges so the grains wouldn't end up where they shouldn't be. A few rubber stoppers raised all this up off the bottom, and the metal percolator tube passed right up through the middle of all this. Because of the nature of a percolator coffee pot (and coincidental temperature settings) this ends up automating most of the steps in the mash process--to the point where a person could set the thing up in the morning on a timer and have the grains ready to sparge when you got home from work. 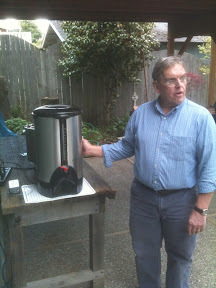 In the coffee pot system, the grains and cold water are loaded in and the pot plugged in. The water heats in the bottom and gets shot up the tube where it hits the lid and washes down through the grains. After about an hour, our thermometer buried in the grains read 170°, at which point the coffee pot shut itself down. It held temperature for the entire 90 minute conversion. Meanwhile, we heated the sparge water on a little hot plate burner (like you might in an apartment) which was ready to go at the end of the mash (and we didn't even blow a breaker). 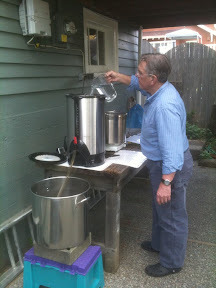 We sparged and the wort drained right out through the spout at the bottom of the coffee pot into our thirsty brew pot below. 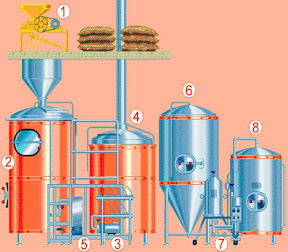 Just about as simple as all grain brewing gets. We decided to boil on our high power outdoor gas burner. I've made beer on a hot plate before (in my dorm room, but that's another post for another time). 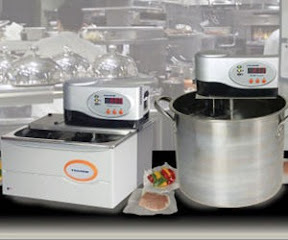 Let me tell you, it takes forever to get 6 gallons to boil on a little hot plate. So we boiled and hopped as we usually do, and then it was time to wait for the fermenting to see if we had just totally ruined a nice big bag of malted barley or if, in fact, we had just revolutionized lazy brewing forever. The specific gravity was right on track for what we were expecting, which was a good sign. But then again, you never know until you taste it. It's been an extremely intense week in New Orleans exploring vocation with these future pastors. Temperatures around 100°, humidity like a health club steam room, and a packed conference schedule--combined with an intense dose of the reality of the struggles of the people of New Orleans--has made for an emotionally and physically exhausting experience. As I travel home I'm replaying the images of this past week in my head, and will likely continue to for quite a while. One of the things that struck me in New Orleans was the very visible presence of cemeteries throughout the city. The shortest route between where we were staying and the conference events led through a cemetery, and so I walked through several times each day. In the places I have lived (Pacific Northwest and California) we choose remote places outside of the hustle and bustle of daily life to build our cemeteries. They are places to make a pilgrimage to on Memorial Day or other special days, but not part of the day to day life of most people. But in New Orleans, cemeteries seem to be everywhere. In part, they are simply more visible because (as was explained to me) if you try to burry someone "six feet under" you'll find water--so burials are done above ground. This leads to raised tombs and multi-story mausoleums. The grave sites are also very close together, making the cemeteries quite visible in neighborhoods--even when the cemetery is small (which many of them are). And yet, it seems like every neighborhood has a place to bury their dead--and there are some sections of town where there is an entire neighborhood of cemeteries. As I reflected on the graveyards and the struggles of the entire city, I was struck by the similarity in the appearance of the above ground tombs to the bare concrete pads of homes destroyed in Katrina. Like the tombs, these homesites are present and visible in every neighborhood, and bear constant witness to the reality of death and loss. 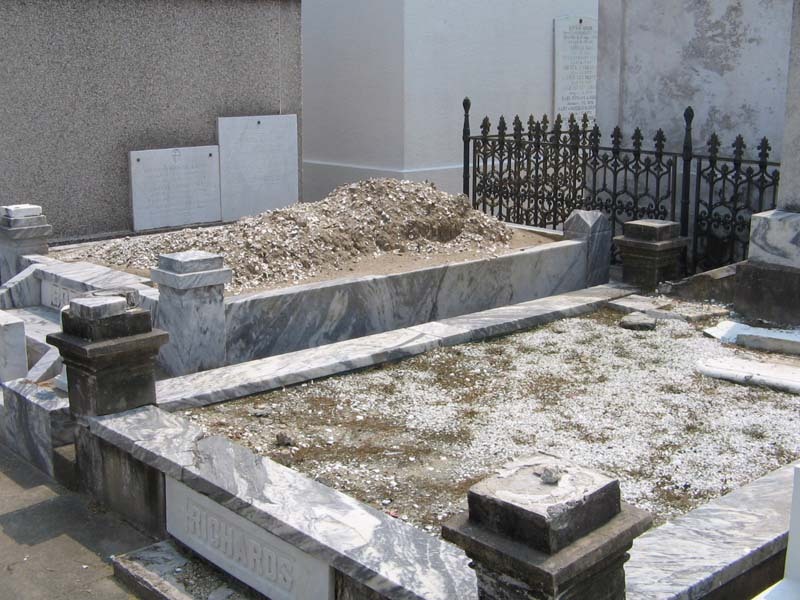 It seem as though--in contrast to most of American culture--there is something different about death in New Orleans. The tradition of the "second line" funeral procession--a joyous celebration with marching bands that follows the solemnities of funeral services--bears witness to this. Death and the dead are not sequestered away to romantic, wooded retreats, but are part of day to day life. In the aftermath of Katrina the reality of death is even more present--with the spray painted "X" marks of the search parties remaining on many of the homes noting how many dead were found in this particular house. The presence of destroyed homes and businesses reinforces this reality--as it's hard not to remember that many, many people lost their lives here. And yet, the spirit of New Orleans is not one of hopelessness. You can hear in the stories of those who have been working for years on the efforts to rebuild that there continues to be a great deal of hope despite the hard realities that they have faced and continue to face. The people of New Orleans are finding strength to keep going and to re-create their lives and communities. And you can see and hear in the Christian communities that the resurrection of Jesus is not only a source of hope for the future, but the daily hope that they are working together to embody. The work of restoring neighborhoods, of cleaning up trash, of helping people and churches return to their homes, of supporting one another, and showing to the world that there is hope despite all appearances, that there is light even in the midst of deep darkness, and that there is profound worth in what seems so worthless--this is the work of resurrection. And thrust into the shared story of seeing their city brought to its knees by Katrina, the people of New Orleans have found connection to the resurrection story--as Christian communities are leading the way to not only restore hope, but to embody new life in visible, tangible, and transformative ways. In my many walks through the cemetery, I noticed the abundance of flowers on the graves. Perhaps the constant presence of the dead is a reminder to those in the neighborhood to remember and celebrate life. Flowers in funerals and graveyards are meant to be symbols of resurrection--dead seeds that lie in the ground all winter that then burst forth with new life in spring bringing renewed beauty to an all-too-barren world. The image of New Orleans I carry back with me is one of these tombs/homesites full of blooming flowers--death and resurrection together, of crucified people drawing on their shared stories and shared pain to bring about real hope in the midst of hopelessness. I struggle, as do many people in my generation who are involved in the Church, with moments of hopelessness about the possibility of transformation for this institution that seems so broken--that seems at times to be doing more harm than good, and often proclaiming anything but the Good News of Jesus. And yet, I continue to believe that God has chosen the Church to be a unique witness to resurrection in the world. But sometimes it's hard to see what God is doing, and hard to imagine how we Christians will be able to get over the petty bickering and side issues we spend so much time on and really focus on being God's people in the world for the sake of the world that God has created and loves so much. One of the things I value about all my work with FTE over the years is that through these events and especially through the people I have met, I get to see and be a part of the Church that God is bringing into the world. It's a Church where we have found unity in Christ and are working to overcome those denominational and other issues that have divided us. It's a Church where we truly value where one another are coming from, and the unique gifts that each of us brings from our traditions and our unique stories. It's a Church where the Scriptures and the ancient spiritual practices (and some new ones too) create a community that nurtures the callings of all of God's people. It's a Church that intentionally cultivates leadership in young people, helps them notice their giftedness and their callings, and walks with them as the develop into those callings. It's a Church that makes a difference in the world and works for justice, that isn't afraid to confront racism, sexism, heterosexism, classism, and all the other systemic violence that affects all human endeavors. It's a Church that in word and deed bears witness to the power of resurrection, to the Good News of God's love that we are privileged to get to embody with and for one another. For a few days this week I've gotten to be immersed in this Church once again, to participate in the good work we share together, and to be blessed by the amazing young people God is raising out of this generation to lead the Church into the future God has in mind for us. As we are now scattered to the ends of the earth (well, ends of the United States anyhow) I find myself filled with hope that like New Orleans, we are rebuilding what has been torn down--and that the power of resurrection will continue to blossom and spread. We spent the day today (a long one) more deeply connecting to the city of New Orleans--first with a bus tour to some of the parishes and neighborhoods most affected by hurricane Katrina. (This image shows where the flooding was the worst, and we saw most of these). We saw some of the flood damage, and the efforts to rebuild. We listened to leaders like Pastor Sean Anglim at First Grace United Methodist Church whose congregation was the result of a merger when two struggling churches whose buildings were damaged by the storm. Though they had been less than a mile apart for 100 years, they had never worked together. First UMC had been historically white, and Grace UMC had been historically black. In the conversations about working together someone asked a self awakening question: "Could we better bless our city together or separately?" When they took that question seriously, the began the process of becoming one congregation working together to make their community better. Inspiring. After a trek around the city in which it was hard to take in all the hardship that people continue to endure so long after the storm, we enjoyed authentic New Orleans po-boys (mine was oyster, yum!) and then set out to the lower 9th ward to roll up our sleeves and do some hands on service. It was close to 100° and at least 3000% humidity, but it felt good to actually do something constructive after seeing so much need. One topic of conversation among the folks working was "What good does a few hours of picking up trash or cutting grass actually do?". And it's true, our service sees pretty insignificant in the grand scheme of need--and perhaps might even be seen as patronizing by the folks who's neighborhood we invaded for a few hours before getting back on our air-conditioned busses. But the conversations we had around the value of this time were to frame it more in terms of participating in the Christian spiritual practice of service. It was one simple way to practice what is meant to be a lifelong spiritual activity--serving ones neighbor wherever one found one's self. In fact, the entire week was set up to lead this community of future pastors through a time of practicing Christian disciplines that are connected to vocation and ministry. New Orleans became the context and the frame in which the students explored creating space to nurture and deepen their vocational discernment. We used as a tool the practices developed through FTE's Calling Congregations program--tools for opening up conversation, story telling and holy listening, reflecting theologically on our stories in light of God's story, and moving towards action, both individual and collective. Along with those came the spiritual disciplines of service, worship, prayer, fellowship, and shared meals (good ones at that!). We ended the day with a spectacular crawfish feed and worship at All Souls Episcopal Church and Community Center. All Souls has also come to be known as St. Wallgreen's because this church was founded post-Katrina in a former Wallgreen's drug store that the chain decided was not worth rebuilding. This seems to be the theme in much of the 9th ward and other of the hardest hit (and also the more impoverished) areas of the city--these areas which were impoverished before the storm are simply not worth rebuilding. But the residents of those communities, and the churches and other agencies working tirelessly to rebuild there, are telling a different story--a story where all of God's people are valued and where everyone's community is worthy of being cared for and rebuilt. Our tour guides shared with us some of the less well know issues that have gone along with the reconstruction--including demolition of homes that were not storm damaged to make room for the green space that is in the new city plan and what they called "disaster capitalism" a wave of folks who came (and continue to come) to New Orleans to make a buck off the disaster often at the expense of those with the least resources. It's clear that the work of rebuilding continues and will for a very long time, and that there are lingering issues of justice, racism, classism, and all that goes along with systemic oppression. There is much work that continues to be done. Though today was exhausting and emotionally challenging, but as I debriefed with the students I was working with, I saw a great deal of hope in them. They were inspired by the people we met--people from churches and neighborhood groups who have overcome the differences that previously divided them in order to do the hard work that God has called them to do together for the benefit of one another and those in need. And as I listen to these young people and the hope they see in New Orleans, I am renewed in my hope for the Christian church. Through this time together with FTE these young people from a whole range of denominational and cultural backgrounds have also been practicing overcoming differences with one another, and are beginning the work of overcoming those differences so that they can work together for the benefit of the whole Church and the whole world. I'm in New Orleans for the Ministry Fellowships Conference with The Fund for Theological Education. I'm serving as a round table leader, guiding a group of first year seminarians at they engage this conference--and walking with them through the vocational discernment this conference is meant to stir up. Its an honor and a blessing to be part of this organization, and to get the chance to participate in this way. I attended this same conference in 2001, when I received a fellowship as a new seminarian. Its great to be a part of this again, and to give back to an organization and an event that was powerful for me, and an important part of shaping my own vocational discernment. The first day, one of the questions posed to the leadership group was "Why did you say 'yes' to be a part of this event?" The first part of my answer was that I've never participated in an FTE event that I didn't receive more than I gave. But as I pondered the deeper answer to that question, a big part of it has do do with gratitude for the way that FTE has helped me in my own vocational discernment--especially recently. In addition to the FTE fellowship I received in 2001, I've gotten several opportunities to interface with FTE and the various projects that they have been working on. Most recently that has been working with their "Calling Congregations", "Notice, Name, and Nurture" and "VoCARE" events--events that are meant to foster congregations as centers of vocational and theological reflection. I've really enjoyed getting trained in their approach (even though my opportunities to enact it in the congregational setting fell apart). The training itself was transformative for me, because as we practiced how we might lead conversions about call and purpose in our congregations, we were all invited (and challenged) to dig a little deeper into our own stories of call--how and where and when we felt (and continue to feel) God's call for our lives. Going through that process really helped me clarify some things I had been wrestling with in my congregational call--and as that was drawing to an end, about what I felt called to next. It was through the FTE vocation care process that I gained clarity about what God was calling me to do. At one of the events I crafted this call statement: "My call is to encourage and challenge the Church to live more fully into God's dream by innovating in and among communities who are engaging the resources of the Christian faith to include and empower young adults." As my congregational call was ending, and I was looking for the next ministry that God was calling me to, this statement and the accompanying reflection that happened through those FTE conferences guided me in making the hard decisions that were before me--and gave me the courage to take a leap of faith into the current work that I am doing as Campus Pastor and Director of Spiritual and Vocational Formation at Trinity Lutheran College. The past three months that I have been in this call have been one verification after another that I am doing what God is calling me to do at this moment. The joy of working with the students at Trinity, the opportunity to foster vocational and spiritual formation among the entire college community, and the freedom to innovate with creative expressions of worship is like a dream come true for me. Its a kind of feeling that you can only experience when (to paraphrase Beuchner's words on vocation) "your deepest joy meets the world's deepest need." It's a joy I intend to pass along to the students (and others) that I will work with. As I reflect on my call statement, it is no wonder to me that I would commit a week to be here in New Orleans with these future pastors--to be part of their journey of self discovery and discernment. FTE is a community that engages the resources of the Christian faith to include and empower young adults--in fact, I believe the work of FTE will emerge as some of the most significant work being done in the Church. I am overjoyed and most certainly blessed to be here with these folks--sharing cafe au lait, beignets, and deep conversation about what God is calling all of us to be about together. This is an open time for conversation around this topic (and any others that seem important). Please allow everyone in your group to participate in the conversation (or not to if they so choose). Conversation starters are on the back if you want to make use of them. There are no right answers. Just don’t be jerks. And tip your servers. What does the word power stir up in you? What images of power do you see in the media/art/music/etc? Where do you see power used well? Where do you see power abused? Do you consider yourself powerful? Do you want to be powerful? How does a person gain power? How does a person loose power? (if there is a Lutheran theologian in the group) Explain the “theology of the cross”. How does that affect how we see power? Is it possible to share power? To give power to others? To take power from others?